Anritsu Corporation exhibited its measurement solutions jointly with ETS-Lindgren Japan at Wireless Technology Park 2018 held at Tokyo Big Sight from May 23 to 25. ETS-Lindgren Japan introduced its AMS-8040 Antenna Measurement System at the ETS-Lindgren Japan booth in conjunction with Anritsu’s Wireless Connectivity Test Set MT8862A and Bluetooth Test Set MT8852B to demonstrate a WLAN and Bluetooth OTA measurement solution. Anritsu introduced its MT8862A at the Anritsu booth in conjunction with ETS-Lindgren’s Model 5601 RF Test Enclosure as a WLAN measurement solution in a noise-free environment. Use of WLAN and Bluetooth communications is spreading rapidly as IoT applications move into home electronics, such as printers, TVs, etc., automobiles, industrial machinery, sensors, and more. Assuring the communications quality of these equipments by measurements such as testing antenna characteristics and TRx sensitivity in an OTA environment cannot be ignored. On the other hand, WLAN and Bluetooth are common short-range wireless communications technologies using the 2.4 and 5-GHz bands that are used by many other devices, resulting in difficulties creating a measurement environment with as little interference as possible. To help solve this issue, Anritsu and ETS-Lindgren Japan jointly demonstrated their efficient and accurate wireless measurement solutions. 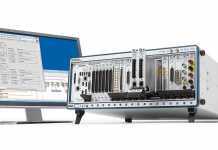 The Model 5601 RF Test Enclosure introduced at the Anritsu booth isolates from outside signal interference to easily configure an ideal measurement environment. Use in combination with Anritsu’s MT8862A supports WLAN quality measurements without impact from outside signal interference. Meanwhile, the AMS-8040 Wireless Antenna Measurement System introduced at the ETS-Lindgren Japan booth not only isolates from outside signal interference but also supports tests of antenna characteristics as well as Rx sensitivity tests. Combined use with Anritsu’s MT8862A and MT8852B offers easy configuration of a WLAN and Bluetooth turnkey measurement environment for efficient OTA measurements.